Many of the best race horses in the world, including Triple Crown winner American Pharoah, will attempt to add to their legacies at this month's Breeders Cup Championships, while others are simply trying to return to the race track. As Time Warner Cable News' Matt Hunter reports, a new facility in Saratoga Springs is helping them do that. Full article and video on TWC News. SARATOGA SPRINGS, N.Y. – Like the rest of us who like to start our days with a little exercise, Dr. Stowe Burke leads a three-year-old racehorse into a specially designed treadmill early Monday morning. "We can adjust the speed," he said. "We find somewhere in the area between two to three miles per hour to be the most beneficial." The only one of its kind in the Northeast, the equipment, known as an Aqua Pacer, is by no means your average treadmill. It allows the horse to exercise partially underwater. "The idea here is we are giving him some buoyancy,” Burke said. “He's 60 percent buoyant, so he is not putting too much stress on that soft tissue." The runner, who's recovering from a soft-tissue injury suffered in training, has been under Burke’s care for the past several months. Last year, the longtime racetrack veterinarian left the back stretch to open Burke Equine Therapy. "Mostly people just turn horses out, which has varied comebacks,” said Burke, who could not identify the horse out of respect to its owner and trainer’s privacy. "Yes, sometimes time can heal all wounds, but sometimes it doesn't." Opened last year on his family's Saratoga Springs breeding farm, Burke's rehabilitation facility also features a salt-water spa that’s designed to reduce inflammation. "The horses tend to like it,” said Burke, who led the colt into the spa after its 15 minutes on the Aqua Pacer were up. “We only put them in for 10 minutes. The water is chilled to 35 degrees." His team also makes use of both dirt and turf galloping tracks for horses further along in their recovery. "We make sure here, whether the issue is orthopedic or soft tissue, to get them to a point where they are sound and they are ready to go back to the track," said Burke, 43, who used to gallop racehorses at Saratoga Race Course when he was younger. With room for between 16 and 22 horses at a time, Burke's clients include some of racing's top competitors, including Saratoga leading trainer Todd Pletcher. "As of the spring, 40 percent of the horses that went back to the track won,” said Burke, who’s dubbed his practice ‘The spa at The Spa.’ “That was awesome. We had four winners this summer at Saratoga." If all goes well, Burke expects the 3-year-old colt to return to training in about two months. The Spa City native says it is that chance to help runners reignite their career that drives him. "If you are going to get up at 4:30 in the morning, you have got to love what you do," he said. For any injuries above the hock area, the ECB Equine Spa has a connective hose (through the filters) to spot treat the problem area with cold saltwater. Cold hosing can be performed alone or in conjunction with a spa treatment. Great for hard to reach areas like stifles! This is Gus, a bright 14 year old Hanoverian x Arab who is currently receiving treatment for a hind leg suspensory injury. The vet has recommended a course of hydrotherapy treatments to support his recovery, so his owners will be bringing him to the Cambridge Equine Therapy Centre over the next couple of months in conjunction with veterinary monitoring. This was Gus' first time on the Hydrotherapy Spa and after acclimatisation he was relaxed and enjoyed the therapy. His owners were pleased with the improvement to the injured area. Dr. Kirk Shumbert of S Bar S Veterinary Service has developed a mobile spa based out of Shannon, MS in the USA. After witnessing the full potential of the spa, Dr. Kirk realised that a lot of stables which have a need for a spa would not necessarily be able to have their own unit. Making the treatment mobile seemed the ideal way create a business and help the equine industry. 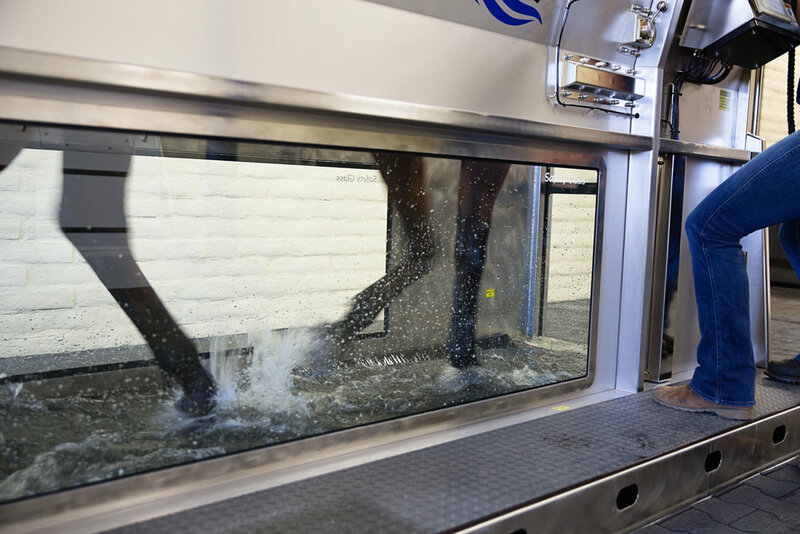 The chilled water is contained in the spa which means once the trailer gets to its destination, horses can be treated immediately without having to wait for the water to be chilled to the right temperature. With the ability to spa 3 horses an hour everybody is happy - especially the horses! Rehabilitating a horse after an injury features controlled exercise that promotes range of motion. A cold saltwater spa for horses was developed in 1998 by Evan Hunt, MVSc, PhD, a retired professor at University of Sydney-Orange, Australia. Dr. Hunt had an interest in race horses and their injuries and worked to develop a way to better treat or prevent injuries. Now equine spas are sold in the U.S. and other countries. Although a great preventive tool, the cold saltwater spa can be used for many purposes. “The cold saltwater spa is terrific for any injury that has pain, heat, swelling/inflammation, or poor circulation due to damage or injury,” says Brenda McDuffee, general manager at The Sanctuary Equine Sports Therapy and Rehabilitation Center in Ocala, Fla.
Grohl says horses might stay at a rehabilitation facility for 60-120 days or longer depending on their needs. McDuffee says hyperbaric oxygen therapy and water treadmills are essential equipment for equine rehabilitation, but smaller pieces of equipment such as therapeutic lasers, electro-magnetic pulse machines, ultrasounds and respirator machines are also an integral part of services. Chris Pollitt graduated Bachelor of Veterinary Science from Massey University, New Zealand in 1968 and was a practising veterinary surgeon in New Zealand, Victoria, Western Australia and Queensland until commencing PhD studies in the Physiology Department of The University of Queensland. To generate a critical mass of research personnel Dr Pollitt, in 1996, created the Australian Equine Laminitis Research Unit, which has become internationally competitive having attracted, in the last 8 years, over $2 million in research funding. With the mission of "Elucidating the mechanism of laminitis to make laminitis a preventable disease" the unit has become an international focus of laminitis and equine foot biology research. Dr Pollitt has 61 publications in international peer-reviewed journals and 71 conference proceedings. In 2009 Professor Chris Pollitt's paper was published into the success of cryotherapy in treating laminitis. The results were conclusive and proved that cold water therapy effectively ameliorates the clinical signs and pathology of acute laminitis. A fantastic breakthrough for both Laminitis and the ECB Equine Spa.